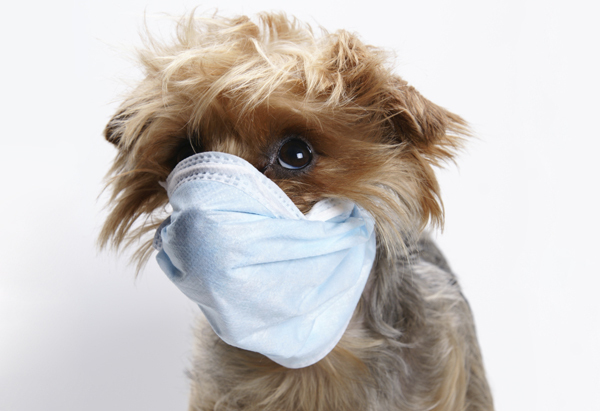 Is DIY Veterinary Care a good idea? As a vet, I know that most pet owners genuinely care and love their pets. I also know that there are times when common sense applies, and things go wrong with your pet that you can DIY (do it yourself) care for your pet, and other times, when a veterinarian is needed. DIY Veterinary Care is like getting a kid to be your vet! In other words, there is no such thing as DIY Veterinary care. Your pet deserves better than a DIY home job when it really counts. Do you have a car? Perhaps you are wondering why I asked that question. I do ... I have an old Honda. It gets me around. The engine sounds fine to me, and I haven't had any problems with it (other than regular maintenance stuff). But it went for its regular check up yesterday, and the mechanic said to me that the clutch is going. I had noted a bit of stiffening, but put that down to the age of the car. It is now going in for a new clutch, before it totally seizes up on me. As I give my car a professional check up at the mechanic, so should you with your pet (not at the mechanic, but at the vets). I drive my car every day, and I spent quality time with it, hearing its humming as I zoom (under the speed limit of course) on the freeway to the vet hospital. I put petrol in it, and pump up its tyres. I speak nicely to my car, as God knows, I can't afford a replacement. But to identify that the clutch wasn't healthy and needed replacement, well that required a specialist ( the mechanic) to identify that there was a problem. I trust my mechanic, and I know he wouldn't say something needed fixing if it didn't. That is where the challenge lies for a pet owner - when does your pet need to see a veterinarian. I think you will agree, that your pet needs to see a vet when there is something with your pet that worries you. And, you may not agree with this next statement, but at least each six months for a general check up. Frankly, many signs of illness are easily missed by owners - you are busy, day in/day out... and there are subtle changes you may miss. Like the broken tooth, or the lump in the armpit, or that the eyes are hazy - why is that so? Or perhaps you are scared of what the vet will say when they see your pet? I had a customer say to me the other week, " I don't like taking my pet to the vet as they always find something wrong with them". This guy is not a client of mine, but I thought "What a strange thing to say", don't you think? I don't go out of my way to find things wrong with pets that I see, but I can't help what I find. I think you will agree, that a great vet is one who does perform a full physical examination, a thorough assessment of everything, and lays it out for you, honestly. And when they find nothing wrong, and say so, you can be elated. That puts a big big smile on my face too. We all love healthy animals! And when the vet does find something abnormal, it is not an insult to how you care for your pet, but it is just the vet doing their job properly... to keep you informed, and give you the knowledge you need to continue to care for your pet the best way you can. My heart hurts when I see a new puppy, and find things wrong. But, should I keep my mouth shut? Not tell the owner? Or should I keep them informed, honestly, and give them the information they need to fix the problem (if it can be fixed). Frankly, burying your head in the sand, and hope the problem will disappear is not a realistic solution. And, ignoring it until it is very hard to fix, even in the best of hands, is criminal. So, DIY is great if you are renovating the house, doing the gardens, or anything where it doesn't really matter if you stuff it up. So what if you try to paint your house, and it turns out splotchy... you can then get an expert to fix that up for you with no harm done. But where your pet is concerned, they deserve more than DIY Veterinary Care. They deserve the real deal. And if your vet is anything like me, they will help you as much as they can, to keep you informed, in the loop, and help you do all the good animal care things, to keep your pet healthy. whose mouth looked "normal" and "healthy"
on the outside, and on xrays, was anything but. There are alot of things that vets cannot do.... and that is live with your pet day in and day out.... you are one of the most important parts of the equation of keeping your pet healthy, happy, and with you forever and ever (or for as long as they possibly could be). Your pet (and your vet) needs you to spot when things aren't going well. DIY Animal Care --- that is you. You can do that, and vets can help you do it better! But you do that part best. DIY Veterinary Care - nah, your pet deserves better. They deserve the real vet. The animal expert. See a vet if you are worried, concerned, got questions about your pet. We are there to help you and your pet. So let us! Your pet will give you big licks, big love bites, and a big grin from ear to ear because they know that you are caring about them, and doing the best you can do, for them. That is all our pets every ask of us. I am going to tell you a little story about Burek. The story is about my first experiences and interaction with a vet, and it wasn't a happy one. Memorable, but not happy. Burek was my dog when I was growing up. He died in 1990, when he was 17 years old. I make no secret that he is a big part of the kind of vet that I am. I got him when I was just six years old. I remember the day he came into my family. 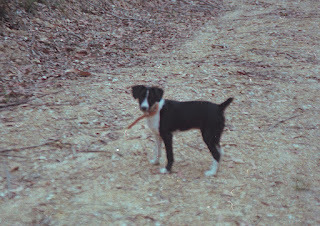 My Uncle John (Jan) knew I wanted a puppy (desperately). My mother was adamant that we were not having one at all. My young brain didn't comprehend that we couldn't afford a pet. So my Uncle, brought this one home for me anyway (as Uncles do). My father fell in love with him, and called him Burek. My mother, well... not a happy Mummy! My Dog Burek... on holiday with us at Ulladulla. When I was about 9, Burek hurt his back leg (he was about 3 or 4 at the time). He was not using it for a week. I cried, as I knew he needed to see a vet. My parents couldn't afford it. I demanded (as 9 year olds do) my birthday and Christmas present be a vet check for my dog. I was a very petulant child. Absolutely, a brat! And I got that vet check. I remember, standing in the back room of this veterinary hospital, with the vet and my mother. My mother, as a "New Australian, comprehended what he was saying, but with her strong accent, he struggled to understand her. I couldn't stop crying. My dog had a broken bone in his ankle, and it needed surgery or he needed to be euthenased. Those were the choices given to us. It cost $60 for an xray for my dog. It was going to cost about $600 to fix the leg. And it had to be my mother who was there, with me, not my father (who loved the dog as much as I). And, we were poor. Desperately poor. My clothes were from the op shop (if I was lucky), or from the suitcase that was left behind from the previous owners of our house (my parents bought a deceased estate with all the stuff left behind)... the food we grew in the backyard, or killed (chickens) or my mum used to dig out of the bins at Westfield Figtree. Yes, we were that poor. I remember that clearly. When you are that poor, you don't forget. So $60 was a big deal. And $600.... well, impossible. Why am I telling you this story? Read on, and you will see. Obviously, it wasn't looking like a great birthday after all. I was in absolute tears. I had demanded my dog see a vet, and he was going to end up dead as a result of it. You'll remember I mentioned earlier that he died when he was 17, so he obviously was not euthenased then. As I've mentioned, my Dad loved Burek, and would not have him euthenased. My mother, well, she loved my Dad and I, so she put up with it. Burek came home and my father wrapped a bandage on his leg. I remember the vet's comment being that we have doomed our dog to ongoing pain and suffering. And as a 9 year old, I was in tears at that thought. Each few days, my Dad would change that bandage, and we would keep Burek still. My Dad would lovingly massage that leg, and maintain Burek's muscle mass. Anyone who knew my Dad, would know that he loved his massage gizmos. By the sixth week, Burek was starting to place weight on that leg, and by 8 weeks, he was normal. As I've mentioned, there are times when you need to see a vet, and there are times when you can do it yourself. But we needed to see the vet to actually know what the problem was, and what our options were. In this situation, that vet gave us only two options, neither of which we could do. If only he was prepared to work with us, or help us, even if it was a "less than ideal" solution to the problem. Without the vet, we would never have know what was wrong with Burek's leg. And without my father's common sense and animal expertise, Burek's leg would never have healed as well as it did. This is not exactly the perfect harmony between vet and owner. But as a result of this, my first real interaction with a vet, it has made me into the vet I am today. I think you will agree that Burek deserved better than he got that day in the veterinary hospital, and he deserved better from my parents too - it shouldn't have taken a 9 year old having a temper tantrum for her dog to see a vet. Perhaps you are wondering if I am anything like that vet from many years ago? I hope not. But he did leave a very strong, very lasting impression on me. From him, I learnt how it felt to be on the receiving end of an uncaring, unempathetic vet (as I perceived him through 9 year old eyes) And I vowed never to do that with my own pets and their owners. But from this situation, I also learned a lesson that having a pet is a financial responsibility, not just an emotional one. And it is something that all pet owners need to remember too. What is the point I am trying to make? That vets and owners need to work together to look after the animals of the world. That we need to appreciate and understand our individual strengths and weaknesses, as that is what our pets deserve... the very best in care. Our pets deserve vets. Desexing a female dog involves what??? Really???? Note well.....This is not a debate about whether vets over charge or under charge for this major operation. A long long blog follows.... all about what desexing a female dog (or cat) truly involves. But, do you really know what it means? Do you really know what it involves when you ring up the vets in the area, for the "just needa price on desexing my dog" call. We get that call multiple times a day, and while we love to give you "just a price" for it, it is important for you to know that alot goes into this procedure that some of you are willing to shop around based on price for. So when you do go to make that phone call (and I am not saying you shouldn't), you really need to ask some other questions also. Who is actually going to do the anaesthetic and the surgical procedure on my dog? Yup, this is a genuine question you need to ask. Many practices that hire inexperienced vets, will often get them to do the procedure (and this is fine, as we all need to start somewhere). But you might have a preference.... you might not. But even if you don't, knowing that Dr Sam is doing the procedure, rather than "one of the vets" is always nice to know. Does the price include pain relief? Now this is as much as a shock to me as it could be to you... but some veterinary hospitals do not give routine pain relief for their desexings (or many other procedures too). Most do. But if you are just asking for the price, you don't know if you are getting the price that includes pain relief, or whether you are going to get hit up for another $25 on the day (as of course, you want your baby to have pain relief after this procedure). What anaesthetic monitoring is performed on my pet? I used to work in a veterinary hospital, where the vet was monitoring the anaesthetic as well as performing the procedure - that means one person doing two jobs! And we all know what that can mean! Happily, this is not a common occurrence these days, but it is still out there... and you need to know! For me, I would never subject my children (or pets) to an anesthetic unless I knew they were being monitored by a human, as well as modern monitoring equipment. What after care does my pet need? Who am I going to be able to contact if something does go wrong? Look, complications are uncommon, but we are talking about major surgery here... and things may not always go according to plan. Who can you call? Who do you call? Can my pet have dissolvable sutures? Dissolvable intradermal sutures are less irritating for your pet, and the wound usually heals faster too. And it means your pet doesn't need to come back to have sutures removed (which is uncomfortable). We do intradermal sutures routinely, as your pet's comfort is my prime concern. But external sutures are faster to put in, and cheaper too. What other fees may I be asked to incur on the day? We don't like putting pressure on the spot about whether you agree to your pet having pre-anaesthetic blood work and intravenous fluids. For us, we like all of our anesthetics to get "the full deal" and we offer you the two packages which give you reasonable options. But we don't make it a secret that we only reveal to you on the day you come in that your pet we will strongly recommend a full pre-anesthetic blood testing and intravenous fluids, amongst a few other things, and we are upfront about that when you call. Make sure when you do your "ring-a-round" that you ask these questions too. Now, comes the squeamish stomach stuff. What does the procedure actually involve? I can't speak for all veterinary hospitals, and I am not going to include a step by step blow of what we do, but it isn't a "tying of the tubes" which some people assume that it is. It is a full removal of both ovaries and uterus - the female reproductive organs. Now, if you were a human, you would be in hospital for up to a week after your "hysterectomy". In dogs and cats, it is called an ovario-hysterectomy. I call it "Major Abdominal Surgery", and with any major abdominal surgery... welll it is Major! As I said earlier, it is not a "tying of the tubes". So lets start at the beginning. It starts the night before, when you give your baby some dinner, and then nothing more to eat after 10. And the next morning, you have two big eyes looking at you expectedly, wondering what they have done wrong to go without brekky. But you know! A trip to their most favourite place in the world (not) is next.... the vet hospital. We greet them with our excited voices, but whilst they love people, they are not so sure. A small tail wag maybe, but with their favourite blanky and toy, they are settled into their new home away from home. The owners don't get away with it pain free either, as a Consent for perform surgery needs to be filled out, with lots of questions answered. After a full physical examination is done, blood is drawn for the pre-anaesthetic blood testing. This checks the internal stuff, that the external examination may not pick up. It is extra information which is very helpful. We use all of this information to then formulate an "anaesthetic plan" - what this is, is an assessment of the breed, age, activity, stress level, and examination results to determine the right combination of drugs that should be used. Whilst the sedative is taking effect, Dirk prepares the operating theatre for the procedure. We have a dedicated "treatment room" and a dedicated "operating theatre". The treatment room is where the bulk of the examination occurs, and also doubles as our "prep room"... that is, where your pet is initially anesthetised, and the fur shaved off, and "prepped" for surgery. A cannula (or catheter) is placed into your pet's vein on their leg, and intravenous fluids is started (going on the drip). The anaesthetic machine is now all set up. An injection of anaesthetic drug is administered intravenously, and your pet is patted whilst it drifts off to lala land. A tube is placed into your pet's airway, and they are connected to a gaseous anaesthetic machine, which allows controlled amounts of anaesthetic and oxygen into your pet for the entire procedure. After this, the monitoring gear is attached. This never takes away the need for a human body to check, but every little bit helps. We have, what is called, a multiparameter monitor.... I call it the things that goes beep and bling. It does alot of things, and is usually found in specialist centres. We also have another pulse oximeter too, but this is used for short procedures, and measures only oxygenation and pulse strength. So, whilst the machine (and human) monitors the heart rate, respiratory rate, blood pressure, carbon dioxide level, breathing pattern, temperature and ECG (whew)... the haircut happens. Dogs, as you know, unless they are the hairless kind, have lots of hair. Hair and surgery do not mix. A haircut is given around the surgical site area, to ensure maximum sterility. Alot has happened up until now, and the "desexing" hasn't even started yet. The skin needs to be cleaned up with specialised antiseptics. But where is the vet? What is Dr Liz up to? I double check that the kit is set up ready to go, that our operating table is in the correct position, and the heating element is on ( this is awesome! - keeps the animals at a controlled temperature). I don my hat, my mask, and then do the "scrub up". You know, the tips of the fingers to the elbows thing like they do in the movies. The scrub up is the part I hate. A full 5 to 10 minutes is dedicated to this part..... A surgical gown goes on, sterile gloves, and then it is show time. The patient, by then, is transferred to the operating theatre by the veterinary nurse, and is laid out. As we have a V Top table, with hydraulic height adjustment, no ties are placed around your pet's feet to keep them in position. They lie there, comfortably, with the drip drip of the iv fluids going through (or most times, we use our hospital grade infusion pump). It is the main show! Scalpel.... forceps.... But first the patient must be draped - this means sterile sheets are placed to keep the only part I need to see in view. In this case, a little section of the tummy, near the belly button. An incision is made through the skin. One layer down. An incision is made through the fatty tissue (the subcutaneous layer). And then, the muscle layer of the abomen is found - and we are looking for the fibrous middle section to find a spot in which to enter the abdomen. This is another scary part - it is at this point, it changes from a minor surgery to a Major Abdominal Surgery. I am about to enter the abdomen of another living creature. Everything is humming and buzzing quite nicely, the heart rate is stable, blood pressure is good. Knock Knock....Enter! And sitting right underneath my entry point, is usually a big fat purply structure - full of blood - the spleen. Now, the fishing expedition starts, which is usually successful, quickly - the first uterine horn is found. The aim is not to touch or minimally touch other organs within the abdomen.... except the parts that you intend to remove. The horn is tracked back up to an oval structure which is the ovary - and then, we see lots and lots of tortuous blood vessels that come off the aorta - these blood vessels need to be ligated (a fancy way of saying, tying them off). Scissors finish the job - so only a small section of tissue with a ligature is left behind on that side, and the ovary and horn is gently lifted out of the body. It is then followed along to the other uterine horn and body, which is also tied off the same way. I am going to stop here for a second to catch my breath! Vets are doing this procedure for $150 or not much more! What do you think it is worth? I have yet to meet a vet that prices this surgery properly. It is a procedure which vets are heavily subsidising, as we seem to have this stupid idea that people realise that the procedure is priced below its true value. You don't, until now. I am in the more expensive price bracket for my area, because I have to cover the costs of the materials that I use.... and I don't use cheap materials or cheap tools. I wonder how other vets could do it for less? I would love to ask them this question, but I can imagine the look I would get! Back to the surgery table - both ovaries are now no longer attached to the ovarian pedicle, which should be well ligated, and released. We know have the base of the uterus to find. We need to place a suture around the area where the uterus and cervix meet - not a mm on either side, but in this area.... fairly precisely. Big blood vessels complicate things, but we deal with them. During all of this, the anaesthetic has been monitored, the local anaesthetic has been administered, the fluids are dripping in, and the surgeon is focusing on each individual task, knowing full well all of the things that can go wrong, and hoping that none of them do. Closing time..... As we went in, we go out.... in three layers, we go out in three too. The abdominal wall is closed to make sure that no fat or other tissue is captured in the process. The subcutaneous layer is closed. And finally the skin. We do dissolvable intradermal sutures, so what we see on the outside is a thin red line. And your pet has nothing that irritates them (other than Dirk's jokes!). Local anaesthetic gel is applied on the skin (we all know how prickly skin can feel after a close shave), and a tummy bandage applied (like an extra large band-aid.... everything feels better when you are hugged). Extra pain relief is given, and the bed is warmed up ready. A gentle pat whilst your pet recovers, helps it adjust from the" sleeping, not being aware" phase of the anaesthetic, to the "just woke up, what the hell happened, where am I" phase (at this stage, the tube that was in their airway is now out). Once settled, they are monitored until they are sitting on their chest, then walking. All pets are monitored, because, really, what has just happened is controlled reversible poison. Blunt, but true. Every day when I go into my lovely little vet clinic at Russell Vale, I make it all about me. What is that I can do to make pets better. What equipment do I need to do a great job. 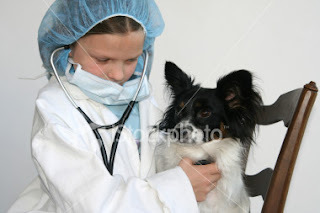 What knowledge do I need to gain to be up there to be able to do the best job as a vet. And in all of that "I" - ing, I forget about something that is very very important. And that is.... you.... yes, you. All that I do as a vet is because I want to help you, be there for you, and help you. As you see, for you to bring your four legged family member into see me, means that you really really care about that bundle of joy that is either sitting on your lap, or fairly close to it. That makes you super-awesome, and I want to thank you. Because without that "you", vets like me, can't do what we do. So, keep up with that awesomeness. Remember that all of us at Russell Vale Animal Clinic are here to look after you and your family. Dr Liz (which is me) looking very tired at the end of the day at home, is supported by her family, which is also her "vet team". Our family comes first, and we open our arms to you for you to be part of our animalclinic family. If you have not been to us before, or not for a long time, come in to see us for a free visit and "check us out" visit. Obligation free enquiries are taken online, so please don't ring the vet clinic for this. Be the centre of our world, as we cannot do what we do, without you.